The discussion featured BLM activist Patrice Cullors and Professor Cathy Cohen. 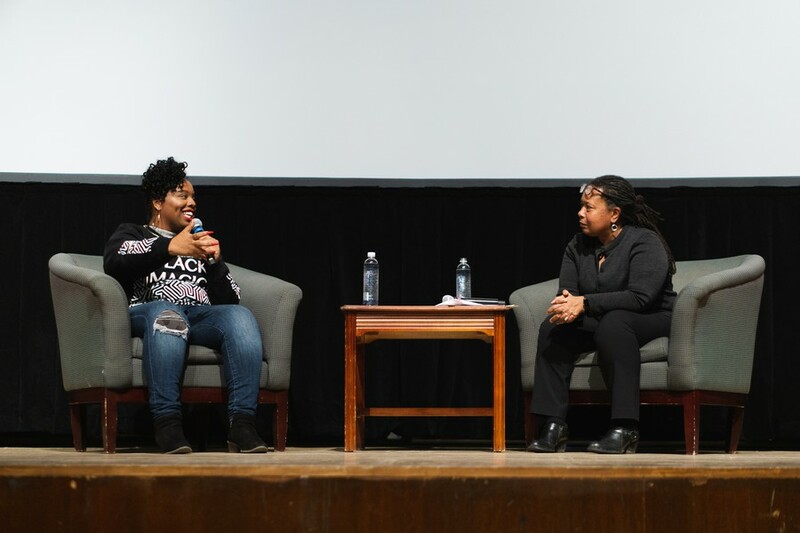 The Organization of Black Students (OBS) welcomed Black Lives Matter (BLM) cofounder Patrisse Cullors to Mandel Hall on Thursday night for their annual George E. Kent Lecture. The conversation was moderated by political science professor Cathy Cohen. The discussion focused on Cullors’s development as an activist, her role in Black Lives Matter, and her current work fighting mass incarceration in Los Angeles. Cullors, a community organizer, is best known as one of the three co-founders of the BLM movement, alongside Alicia Garza and Opal Tometi. She also has deep roots in community organizing in Los Angeles and works with organizations like MomsRising and JusticeLA to address issues such as maternal mortality and mass incarceration. Cullors recently published a book, When They Call You a Terrorist: A Black Lives Matter Memoir. OBS referenced Cullors’s multifaceted perspective as a key factor in their decision, in a statement to The Maroon. Cullors opened by discussing her work within the past month fighting a $3.5 billion jail construction project in Los Angeles County. The County Board of Supervisors struck down the project after 15 years of activist work. Addressing the students in the audience, she emphasized the importance of joining or building an organizational infrastructure. Cullors told audience members that her intention in speaking was to engage more young people in the movement. Discussing the genesis of BLM, Cullors relayed an anecdote of a rally held in the predominantly white Beverly Hills neighborhood soon after George Zimmerman was acquitted of Trayvon Martin’s death, at which helicopter police appeared. Cullors recounted seeing the helicopters and addressing the white passersby. The conversation with Cohen also touched on the importance of Cullors’s insistence that Black Lives Matter focuses on Black lives specifically, and the significance of the movement being founded by three women, two of whom identify as queer. Prompted by Cohen, Cullors spoke to the current political moment, saying that the White House administration represented a “dying” white regime and pointing out the position its consistent opposition to BLM places activists in.